Director Paul Feig and screenwriter Jessica Sharzer give audiences a tense mystery/thriller with as many twists as the friendship bracelets that widow and mother Stephanie Smothers (Anna Kendrick), makes in her spare time. Think of A Simple Favor as Gone Girl meets Double Indemnity and you will get some hints about this picture’s gist and genre. Stephanie becomes involved with an upscale family–former star author and now local college professor Sean Townsend (Henry Golding), his wife Emily Nelson (Blake Lively), and their young son Nicky (Ian Ho)–but with very different consequences than those she had anticipated. Things start off innocently enough when Stephanie, the do-everything mother for her son Myles’s (Joshua Satine) elementary school class, meets the fashion company PR person Emily whose son is Myles’s classmate. The two boys bond and Stephanie is invited to the luxurious Townsend house to knock back some wicked martinis with her new “best” friend, Emily. The two women share backstories: Stephanie’s teenage sexual encounter with her half-brother Chris (Dustin Milligan) and Emily’s ménage a trois with Sean and his teaching assistant Valerie (Gia Sandhu). Emily mentions her family’s financial problems while Stephanie barely gets by on her late husband’s life insurance money. (Spoiler alert: The car crash that killed Stephanie’s husband may not have been accidental.) Besides caring for Myles, Stephanie makes a daily broadcast of a “mom” vlog that features cooking and other handy household hints and will become a major plot device for the remainder of this film. A Simple Favor takes off when Emily asks Stephanie to babysit Nicky while she attends a late meeting at boss Dennis Nylon’s (Rupert Friend) office. Emily fails to return and, after two days without a word, a panicky Stephanie calls Sean who leaves his ailing mother in London and quickly returns home to inform the police. When several more days pass with no sign of Emily, Stephanie plays detective and finds that Emily did not leave town on a business trip and has not checked in with the Nylon office. Stephanie begins a daily missing persons segment on her vlog and soon gets a viewer’s response that takes Sean and her to a lake in Michigan where Emily’s body is dredged up. After the funeral, Sean, Stephanie and their sons spend more time together and the two adults gradually get cozy in Townsend’s home. But rather than being the end, this is only the beginning of a sordid tale filled with surprises that will upend everything we believed was true about the late Emily Nelson. Anna Kendrick assumes a role far different from the rom-com heroines that have made her one of America’s new millennium film darlings. Sensual and stunning Blake Lively, no stranger to dark dramas, is a more than worthy dramatic foil. Fresh off his success in Crazy Rich Asians, Henry Golding portrays an underachieving and convincingly duped husband. Bashir Salahuddin, the politically incorrect local Detective Summerville, Rupert Friend, the snarky fashionista, and some of the other school parents like Andrew Rannells and Kelly McCormack add much-needed comic relief. In fact, clearly funny moments like Stephanie’s futile efforts to unzip one of the late Emily’s tight black dresses when surprised by Detective Summerville visit to Townsend’s house lighten up what could have been some rather dreary proceedings. 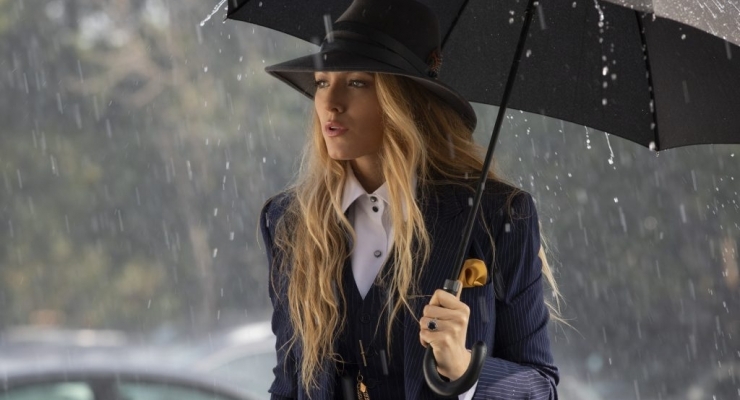 Much in the classic film noir vein but tastefully updated, A Simple Favor succeeds in keeping viewers totally entertained and guessing until the end. Well scripted, directed, and acted, this new film is highly recommended. A dark comedic thriller about a woman trying to uncover the mystery of her missing friend features strong leads from Anna Kendrick and Blake Lively.